At The Dalton School, the primary focus is to nurture children's natural inquisitiveness, develop their self-confidence in their intelligence and in their ability to succeed, and teach them to be responsible and independent learners and thinkers. The school seeks to enroll students of sound character and educational promise who will provide a diverse population in talent, background, and experience. 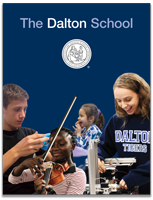 Dalton is looking for students with strong academic potential who will benefit from the school's unique educational philosophy through the methodology of the Dalton Plan. A rigorous and challenging curriculum combined with a dedicated faculty, enables each individual student's abilities and potential to be maximized while encouraging the young person to contribute his or her imagination, curiosity and special interests to the entire Dalton community. View this interactive version of The Dalton School Admissions Viewbook on your computer's browser for best results. The interactive version includes video available on images that display a video play button. Click once (Mac, or PC) or double-tap (iPad/Phone and Android) to play video. OUR PRINT EDITION COMES TO LIFE WITH HP REVEAL --- Videos may also be played magically from the printed edition on most camera-enabled mobile devices using HP Reveal, an augmented-reality application. HP Reveal is available on the App Store or Google Play. Find instructions on the inner sleeve of the print version. The Dalton School offers a Google Translate feature, at the bottom-right of every page, which can translate our website text to over 90 languages. Simply select your language of preference from the menu and every page will be updated in the selected language. Note: Dalton does not own, manage or control any aspect of Google Translate, and is not responsible for the translations provided. Please review the Website User Agreement for more details.